Summary and Definition: The United Nations was formed was on 24 October 1945 to replace the League of Nations which had failed to prevent World War 2. What is the United Nations? The United Nations is a global organization of sovereign States (not dependent upon, or subject to, another power) which voluntarily join the UN to work for world peace and security. The United Nations is a forum for nearly all the nations of the world and its Peacekeepers playing a central role in reducing international tensions and conflicts The UN also addresses environmental, social, economic, and humanitarian issues. The UN has played a major role in helping and protecting refugees, promoting human rights, responding to natural disasters, expanding literacy and has helped to wipe out many diseases. 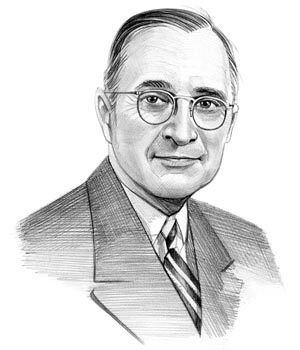 Harry S Truman was the 33rd American President who served in office from April 12, 1945 to January 20, 1953. One of the important events during his presidency was the establishment of the United Nations. Fast, fun facts and Frequently Asked Questions (FAQ's) about the UN. Where is the headquarters of the United Nations? It is based on international territory in Manhattan, New York City, United States. It has three regional headquarters located in Geneva (Switzerland), Vienna (Austria), and Nairobi (Kenya). The goals of the UN also aim to improve living conditions for people all over the world. To meet this important aim "special agencies of the United Nations" have been established that are often referred to as the UN System. The most well known agencies include the United Nations Children's Fund (U.N.I.C.E.F. ), the International Monetary Fund (I.M.F. ), the World Health Organization (W.H.O.) and the United Nations Educational, Scientific and Cultural Organization (U.N.E.S.C.O.) These special UN Agencies and programs provide an interesting insight into the work and goals of the United Nations. The following fact sheet contains interesting information, history and facts on United Nations for kids. United Nations Facts - 1: Mission: The mission of the UN is to maintain peace and security, develop friendly relations with other nations, promote social growth and advocate for human rights. United Nations Facts - 2: History: The forerunner of the United Nations was the League of Nations which was established in 1919 following WW1 under the Treaty of Versailles. The goal of the League of Nations was "to promote international cooperation and to achieve peace and security." The League of Nations was replaced by the United Nations (UN) after failing to prevent the Second World War. United Nations Facts - 3: History: The name "United Nations", was first coined by President Franklin D. Roosevelt when the term was used in the Declaration by United Nations of 1 January 1942, during WW2 when representatives of 26 nations pledged their Governments to continue fighting together against the Axis Powers. United Nations Facts - 4: History: The idea for the United Nations came from the Dumbarton Oaks Conference in Washington, D.C. (August 21, 1944 - October 7, 1944) which recognized the need for a postwar international organization to succeed the League of Nations. United Nations Facts - 5: History: The United Nations Conference on International Organization (UNCIO) was a convention of delegates from 50 Allied nations that took place from 25 April 1945 - 26 June 1945 in San Francisco, United States. The delegates who attended the convention created the United Nations Charter. Poland, which was not represented at the Conference, signed the charter later and became one of the original 51 Member States. United Nations Facts - 6: The United Nations Charter: The United Nations Charter was signed on 26 June 1945 and came into force on 24 October 1945. The UN Charter was based on proposals worked out at the 1944 Dumbarton Oaks conference by the representatives of China, the Soviet Union, the United Kingdom and the United States. United Nations Facts - 7: The UN originally consisted of six main sections, known as organs: The General Assembly, The Security Council, The Economic and Social Council, the Secretariat, the United Nations Trustee Council and the International Court of Justice. United Nations Facts - 8: General Assembly: Each of the Member States of the UN is a member of the General Assembly. The General Assembly provides a forum for Member States and is the main representative and policymaking section of the UN. It makes decisions on important peace and security issues and makes recommendations in the form of General Assembly Resolutions. General Assembly Resolutions also include recommendations regarding the admission of new members and budgetary matters. United Nations Facts - 9: The Security Council: The role of the Security Council is to determine the existence of an act of aggression and a threat to peace and then recommends terms of settlement. Under the UN Charter, the Security Council can take enforcement measures such as economic sanctions and international military action or to establish Special Political Missions in order to maintain or restore international peace and security. United Nations Facts - 10: Economic and Social Council: The Economic and Social Council 54 members are elected by the General Assembly. It leads the UN's social, economic, environmental, humanitarian and cultural activities overseeing the work of commissions which deal with human rights and matter relating to issues such as population growth and new technology. United Nations Facts - 11: Secretariat: The UN Secretariat, headed by the Secretary-General, administers the programs and policies of the organization. The Secretariat consists of administrative staff who undertake the day-to-day work of the UN including research, translation and media relations. United Nations Facts - 12: International Court of Justice: The International Court of Justice (World Court) is the 'seat of international law' and located in The Hague, Netherlands. The offices of the Court occupy the "Peace Palace", which was constructed by the Carnegie Foundation. The World Court consists of 15 judges, elected by the General Assembly and the Security Council for 9-year terms, each from a different nation. The World Court settles legal disputes between nations and not between individuals, in accordance with international law. United Nations Facts - 13: United Nations Trustee Council: The Trusteeship Council was established to administered the UN's trust territories. Since the creation of the Trusteeship Council, more than 70 colonial Territories, including all 11 Trust Territories, have attained independence with the help of the United Nations. It suspended its activities in 1994 when the last of the trust territories, Palau in the south Pacific, became independent. Who were the original Members of the United Nations? 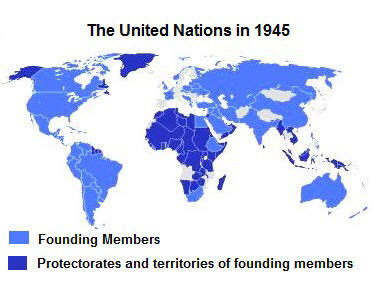 The 51 original members of the United Nations were the Republic of China, France, Union of Soviet Socialist Republics, United Kingdom of Great Britain and Northern Ireland, United States of America, Argentina, Australia, Brazil, Belarus, Belgium, Bolivia, Canada, Chile, Cuba, Colombia, Costa Rica, Czechoslovakia, Denmark, Dominican Republic, Ecuador, Egypt, El Salvador, Ethiopia, Greece, Guatemala, Haiti, Honduras, India, Iraq, Iran, Lebanon, Liberia, Luxembourg, Mexico, Netherlands, New Zealand, Nicaragua, Norway, Panama, Paraguay, Peru, Philippines, Poland, Saudi Arabia, South Africa, Syria, Turkey, Ukraine, Uruguay, Venezuela and Yugoslavia. There are currently 193 countries that are members of the United Nations. The most recent to join the UN was South Sudan in July 2011. The following fact sheet continues with interesting information, history and facts on United Nations for kids. United Nations Facts - 15: Motto: The Motto of the UN is "It's your world!" United Nations Facts - 16: UN Headquarters: The United Nations Headquarters complex was completed in 1952 and is based in on international territory at Turtle Bay, Manhattan in New York City, United States. The territory is administered by the United Nations, but is still subjected to most federal, state and local laws. United Nations Facts - 17: The UN has three additional regional headquarters located in Geneva (Switzerland), Vienna (Austria), and Nairobi (Kenya). United Nations Facts - 18: When war breaks out in a country, the UN sends Peacekeepers to help resolve the conflict and to monitor and observe peace processes. UN peacekeepers consist of soldiers and military officers, civilian police officers and civilian personnel from many countries. Because of their light blue berets or helmets they are often called "Blue Berets" or "Blue Helmets". United Nations Facts - 19: In 1999 an eternal peace flame was installed in front of the gates of International Court of Justice (World Court). United Nations Facts - 20: The Holy See, the ecclesiastical jurisdiction of the Pope and the Catholic Church in Rome, is not a member of the United Nations but was granted permanent observer state status on 6 April 1964. United Nations Facts - 21: To date there are 193 countries that are members of the UN. The most recent to join the UN was South Sudan in July 2011. The article on the UN provides detailed facts and a summary of one of the important events during his presidential term in office. The following Harry Truman video will give you additional important facts and dates about the political events experienced by the 33rd American President whose presidency spanned from April 12, 1945 to January 20, 1953.